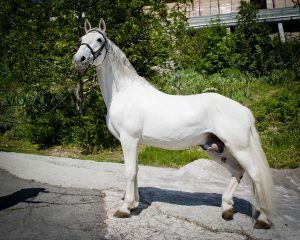 Exterior: … Masculine stallion with natural rising. Very good type, beautiful head, well inserted neck, laid back shoulders, deep chest, well developed withers, long croup. His legs are good from the side but slightly narrow in front. Relaxed energetic and balanced walk. Shoulder free rhythmical trot. Could have a bit better push from the hind legs. Maestoso Romida did a solid test consisted of a driven dressage test, a 15 km country road driven test and a gait test. Romida is also trained under sadle till LA level. He has participated in an educational film in long rains (Anders Eriksson). Breeding results on validation mares and foals 2010 in Sweden.